How would you communicate with students’ parents? Are you flexible with your approach? How? Why do you think that you would be a good fit with this school? Do you prefer to work on your own or as a team? Why are you interested in working for this school? How do you incorporate technology into the classroom? How do you integrate curriculum across subject/content areas? 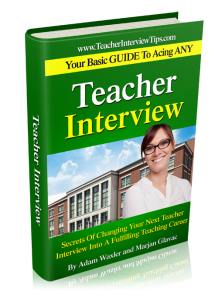 Stay tuned for the next video “Answers to Top 5 Questions They Ask in a Teaching Interview”.